I recently had the delightful and deeply moving experience of spending a month in Guinea staying in the neighborhood where the Guinea Kids students live. Many of these children I knew when I visited 3 years ago and was overjoyed to see them again grown that much bigger! Addams is the girl in the center of the photo above. I fell in love with her the last time I was there. My final memory of her 3 years ago was one of her falling asleep in my lap on my last night in Guinea and then being carried off to bed. I didn’t know if I’d see her again. Then later that year I heard that Addams was no longer living in the neighborhood. I didn’t think I’d ever see her again. 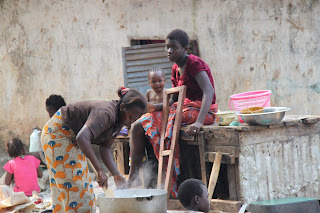 But as Sarah Lee Koumbassa, GKEF board member and my co-host in Guinea, greeted me on my arrival to the Enco-5 neighborhood last December and walked me through the neighborhood introducing and reintroducing me to neighbors and family, a little girl called Addams came forward. I was so surprised and delighted to see her again! And even though I was sure she wouldn’t have remembered me at her young age, we seemed to picked right back up with our dear connection. And so it was with all of my Guinea family and with the children. I am also happy to say that Addams became our newest GKEF student while I was there! There is now a total of 26 children benefiting from the GKEF program. 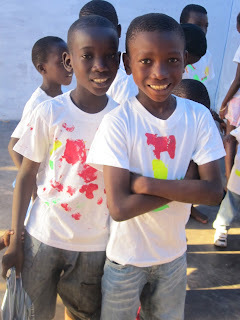 Above are 2 more GKEF students, Mohamed Lamine (a.k.a. Bouboudi which means monkey in his native language of Sousou) and Mohamed (who usually acts more like a monkey than Bouboudi). Here both boys are ready to leave for school. It was deeply satisfying to spend time with each of the children in the GKEF program and to see and feel the impact GKEF is having 3 years after its inception. 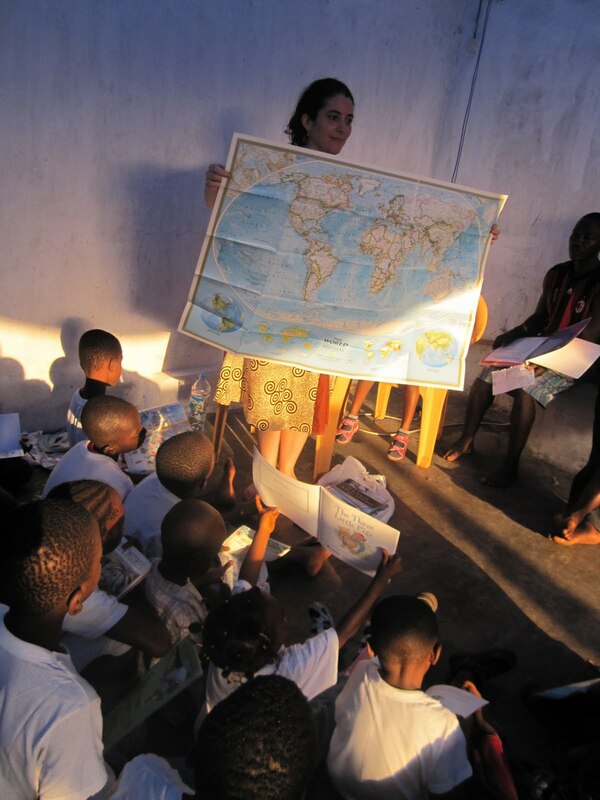 These children are understanding the importance and value of education as they become increasingly aware of all the people surrounding them who want to help them succeed; people like you who live on the other side of the world and yet care enough to support them and their efforts. And, believe me, they all work so hard to do well in school. When asked what they like to do after school, many of the children answered that they like to take their books and study with Soumah, GKEF’s after-school tutor (pictured below center). When Soumah reviews the lessons with the students and asks them questions, they all eagerly raise their hands nearly jumping out of their seats (actually, several of them do jump out of their seats) to be called on to answer. Even if they don’t have the right answer, they still want to participate and learn. Above GKEF’s 3 super staff members in Guinea: Yamousa, Soumah, and Francoise. 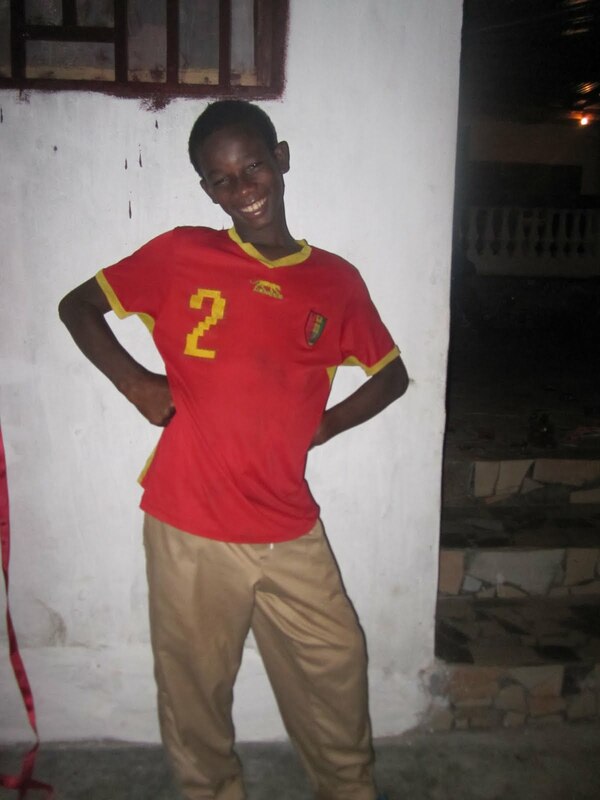 Yamousa, our trusted financial officer, works incredibly hard for his family and for the GKEF program. I was delighted to meet Soumah and Francoise for the first time on this visit. They are the kind of people you instantly know are wonderfully caring, loving, and trustworthy. They are all dedicated to GKEF and we are so grateful for them! I cannot overstate the importance of having trustworthy, dedicated, and competent people providing our program’s infrastructure on location. They give us peace of mind. After-school tutoring time! Or as Soumah and the children call it: Revision (avec l’accent francaise). 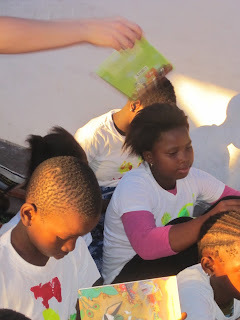 The children sit smooshed onto 4 desk-benches that GKEF provided them last year. Unfortunately, one of the desk-benches was stolen and the 4 remaining are clearly inadequate space for them all. 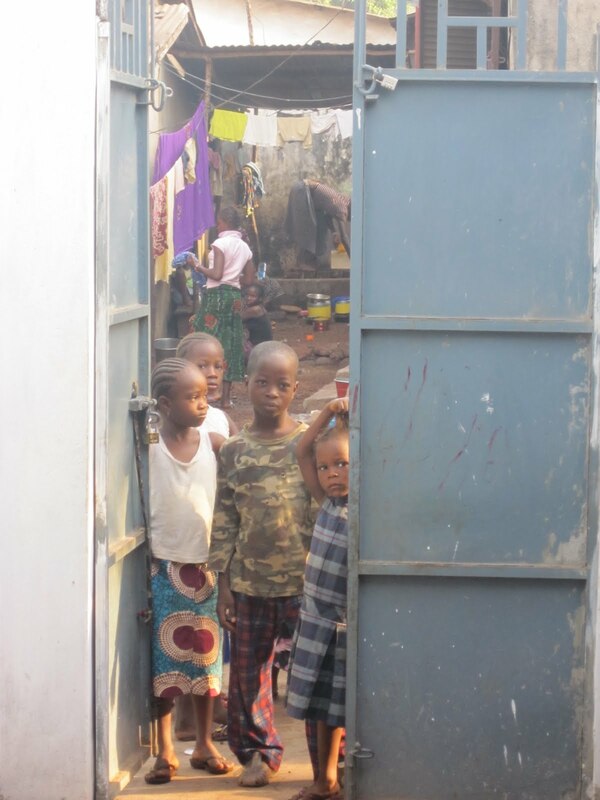 The 5 that GKEF initially provided were still not enough as Soumah explained that the children become distracted by their cramped quarters. 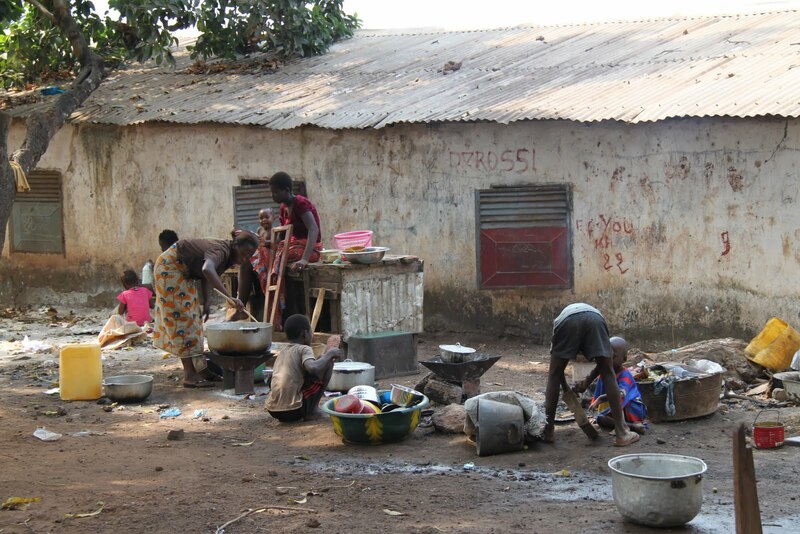 During a GKEF meeting in Guinea, plans were made to have 4 more benches built for a total of 8 for the 26 students. 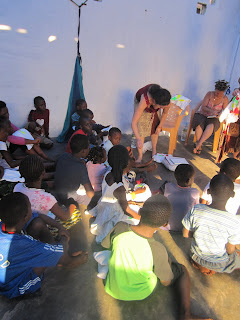 Today Soumah is reviewing vowels with the younger children while the older children read from their lesson books. Above Sedouba takes a turn saying the vowels with Soumah. 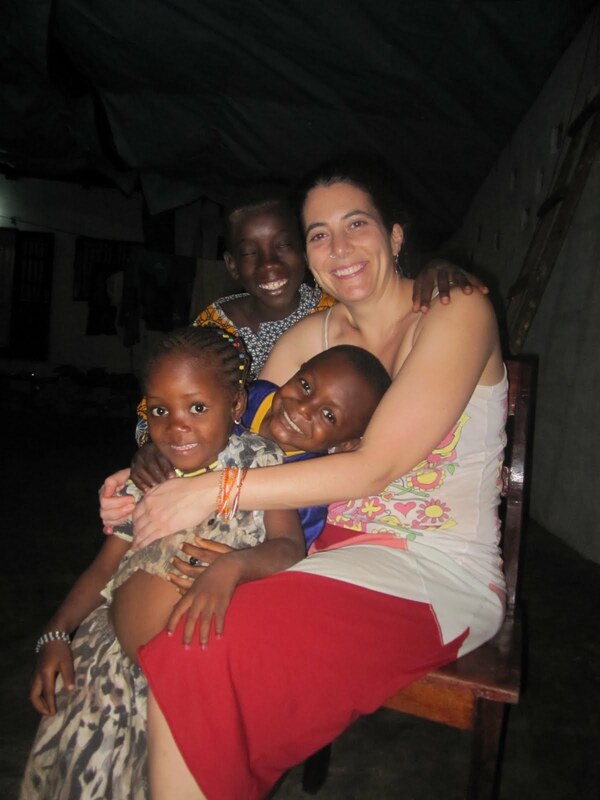 Above and below: Remember Binty Youla from GKEF’s holiday season story card? Well, she’s as bright and beautiful as ever. She always, always greets you with a warm smile on her face. I love this young person’s strength to live in joy even though everyday life holds many hardships. Binty Youla loves school and wants to be a teacher when she grows up. 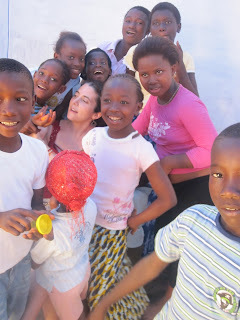 With the help of Karim Koumbassa (GKEF board member and my co-host in Guinea) translating, I met with the Guinea Kids to share some things I brought from the states. Stephie Allard helped pass out the t-shirts that she and others made at Guinea Kids Open House last October. Fasinet and Mohamed model their new t-shirts. I shared a book of stories and photos about New Discovery School where I teach in the states. Books that were donated by families at New Discovery School were passed out for the children to look at. These simple picture books will be useful for them while they are learning English at school. These children have so much joy to give to the world! They play as hard as they work! 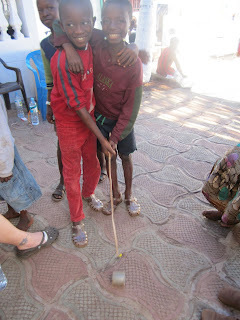 Some of the children learn traditional dance with family friend, Lamini. A big harvest of rice from the family land! 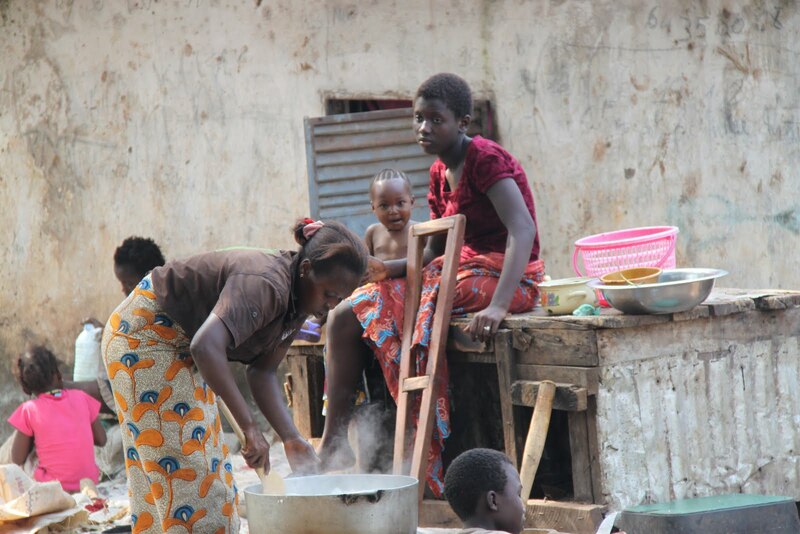 All the children who are around help with the drying of the rice and have lots of fun doing it! Soulyman and Mohamed Lamine were like 2 dogs digging. 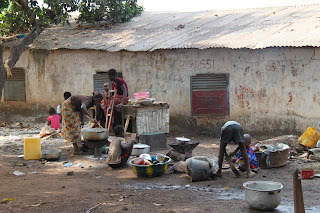 Sarah Lee, N’Bountou, and Youssouf help repackage the rice. 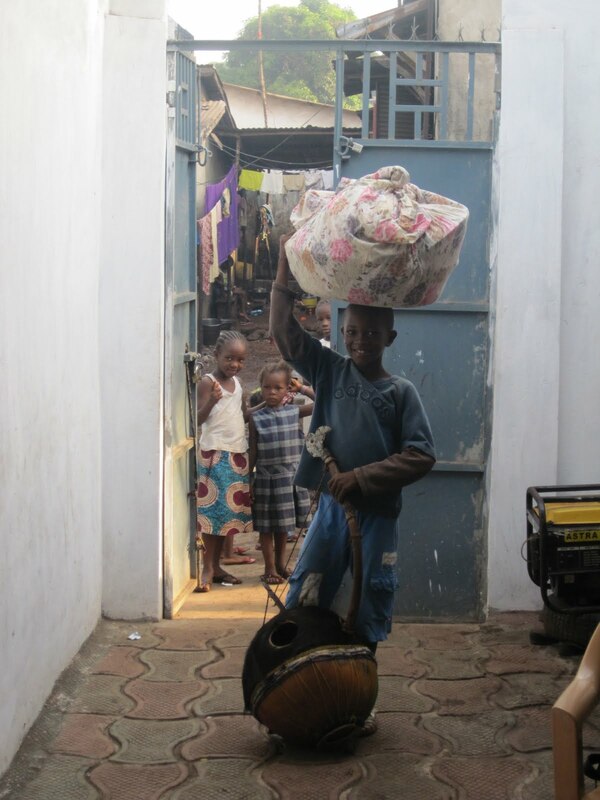 Soulyman helps carry kitchen items and an instrument called a bolon to be loaded up for a trip. Fasinet shows me how to play with the ancient game of hoop and stick. Mohamed Lamine plays an instrument called a gongoma, made from a calabash gourd and saw blades. To know Ismael is to know a bright and shining star. 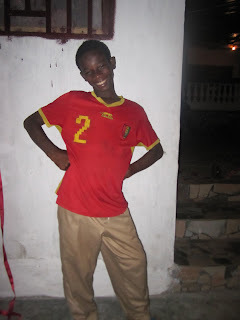 A most charismatic young person, he is our student in the highest level: year 7. Mohamed and Mohamed Lamine (Bouboudi) help little Binty Youla with her drum skills. Lots of this sport happening everywhere. Playing with homemade toys made out of sticks and old tin cans. Bouboudi is even wearing a hat he made out of a discarded piece of cardboard. Ismael helps little Kadiatou on the drums.